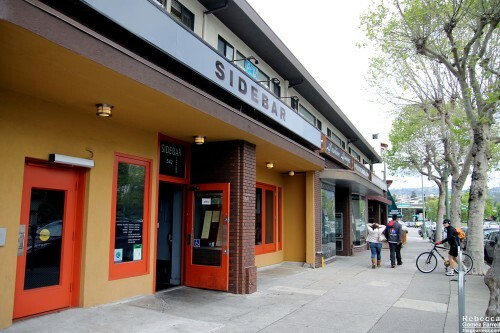 Sidebar is an upscale, Nouveau American joint along the Grand Avenue side of Lake Merritt. Its website boasts Mediterranean, seasonal, local, and comfort foods among its qualifications, so think dressed up French fries, with smoked paprika in Sidebar’s case, and quality meats served with fresh pickled veggies and relishes. I went at lunch. The menu was a shorter version of the dinner one with fewer options not in salad or sandwich form. As it was lunch, that suited me and my companions just fine. Especially because the cocktail list wasn’t shortened at all. The staff was lax on seating—we had to wave down the barman and a busser to get a table though the restaurant was not busy. But our server was attentive and the food and drinks came out with no delays. The décor was pleasant with whimsical lighting and mostly small tables with one large round booth in back. 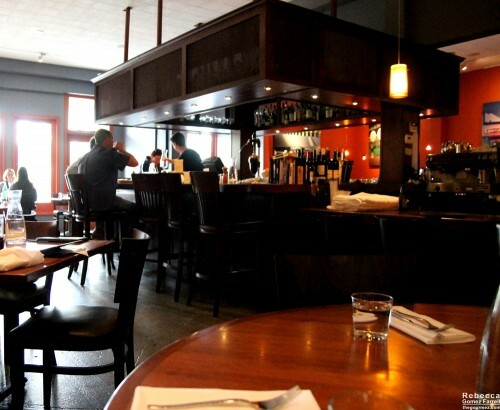 A central bar divides the space; the other side hosts a communal picnic table. Cherry-red wood abounds. I say I believe it’s that drink because we didn’t ask particulars—my companions just wanted a cocktail with ginger and that’s what our server brought. Whatever it was, the drink hit all the right marks for a refresher on a warm weekday: light, vivacious from the mint and ginger presences, and enough rum flavor that you don’t forget what you’re drinking. 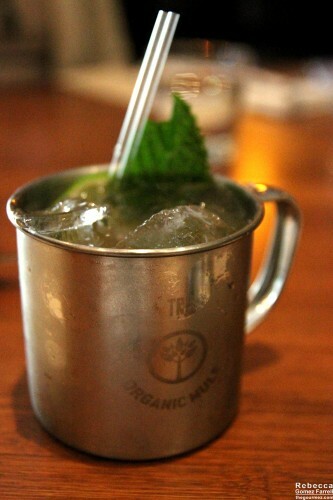 Plus, I’m a sucker for tin cups. Yes, yes, I passionately hate the mason jar drinkware craze for its affected rustic imagery, but I’m all over those cups. I accept my hypocrisy. My own drink was the Caged Heat ($10) made with B & E bourbon, tamarind, ghost pepper, cardamom, and lemon juice. If you don’t like spice, this is not the drink for you. It is absolutely the drink for me. The ghost pepper rose up at the end of every sip, coating my throat with a sensational fire that stopped just short of scorching. Cardamom is also a favorite cocktail ingredient of mine, and it provided the complex sweetness needed to play with that pepper heat. 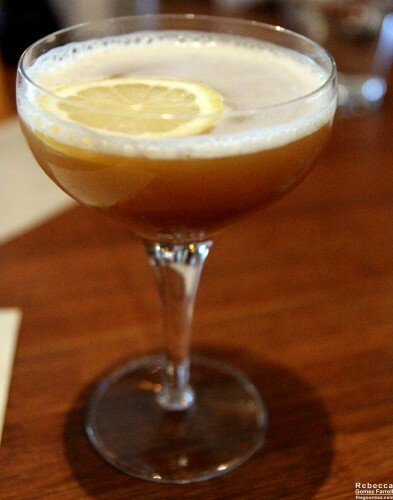 Tamarind grounded it in earthiness, the end result being a well-mixed and memorable drink. 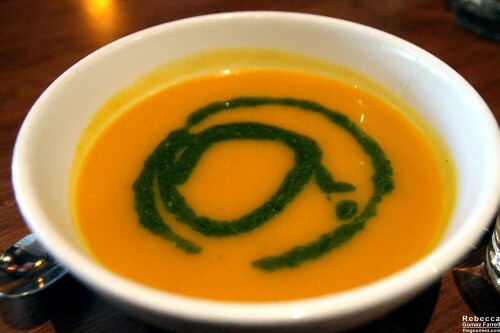 For food, Friend #1 opted for roasted kabocha squash soup with an arugula pesto drizzle. Not only was it quite pretty—who doesn’t love a swirl in their soup bowl?—it was impressively large. I didn’t try it, but my friend was pleased with its robust flavors. 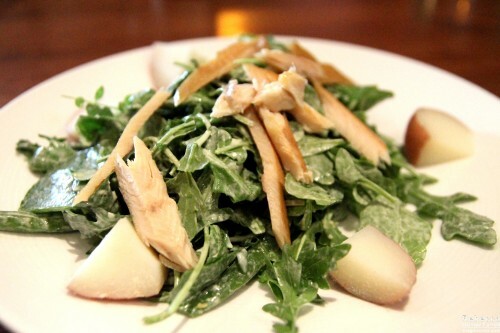 Friend #2 had the smoked trout salad, made with arugula, watercress, new potatoes, green beans, and green goddess dressing. She thought it was great! It looked ideal for those wanting a lighter lunch with crisp veggies and a springtime splash from the dressing. I went full grease in my choice. 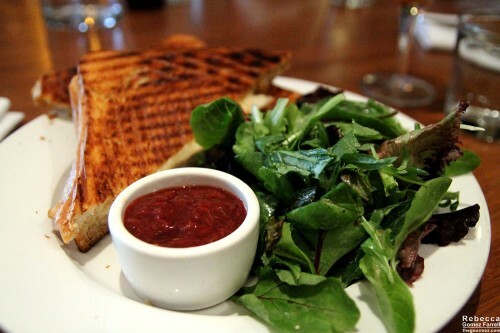 The monte cristo panini is made with applewood-smoked ham from Niman Ranch, smoked turkey, gruyere, and cherry compote. Overall, it was a pretty standard melt, though the bread was almost too greasy to hold up under the weight of the fillings. Gruyere was a great choice for livening up the meats, but the cherry compote was absolutely the star. I made sure to dip every single bite in that ramekin, and the sweetness and mild acidic tang of it made the sandwich more fun to eat. The side salad was forgettable. I’ve been told the hamburgers are the must-have dish at Sidebar. Luckily, the cocktails are more than enough on their own to get me back to try a burger sometime, and my friends’ high opinions of their lunch choices will definitely bring be back despite my own sandwich being average. Average isn’t bad, mind you, and I think I might really like Sidebar’s atmosphere at night when it’s bound to be livelier with an after-work crowd. I look forward to checking it out a second time!